By Scott Gilfoid: The long awaited rematch between Anthony Joshua and Dillian Whyte is said to be happening, and there will be announcement on Monday for the two of them to face each other on April 13, according to Coral. Wembley Stadium Twitter is mentioning that there be a huge announcement this Monday. It’s believed that Matchroom Boxing promoter Eddie Hearn will make the announcement at that time for the Joshua vs. Whyte 2 fight for Wembley Stadium in London, England. BREAKING: Reports that the rematch terms have been signed! So there it is, folks. Joshua vs. Whyte 2 fight to be announced on Monday. Gilfoid can’t say that he’s surprised at this news. It was painfully obvious the Joshua-Whyte 2 rematch was going to be made for April 13 no matter what. It was clear from the beginning that this was the fight that would come next for the 29-year-old Joshua (22-0, 21 KOs). When Hearn booked the giant 100,000 seat Wembley Stadium for April 13 for Joshua’s next fight, it made it necessary for him to pick out a big enough name to sellout the stadium or at least sell a major portion of it. There’s only three names – Deontay Wilder, Tyson Fury and Dillian Whyte – that have enough popularity to help sellout the huge 100K Wembley Stadium. Unbeaten American heavyweight Jarrell ‘Big Baby’ Miller (23-0-1, 20 KOs) isn’t popular or talented enough to help bring in a lot of boxing fans for the April 13 fight against Joshua. It had to be Whyte, Wilder or Fury. With Wilder (40-0-1, 39 KOs) and Fury 27-0-1, 19 KOs) expected to fight each other next, it left only Whyte. Hearn, of course, would do anything he could to make the Joshua-Whyte fight happen. Whyte had complained recently of not being satisfied with the initial offer made to him for a fight with Joshua. Hearn then made it clear that he was going to sweeten the offer for Whyte. Just how much more loot Hearn gave Whyte is unknown. It’s possible that Whyte ended up a split of 70-30 or 65-35 for the Joshua fight. It’s hard to imagine Hearn giving Whyte the same 60/40 split that he offered Wilder an Fury. Whyte being matched against Dereck Chisora last month on December 22 made it pretty obvious that he would be next for Joshua to fight. Hearn spoke of wanting to match Whyte against Luis ‘King Kong’ Ortiz, but that fight was never going to happen due to how risky it would be for Dillian. Instead of making that fight and watching Whyte lose, he was put in with journeyman Chisora, and he struggled like mad to win that fight. Whyte looked awful against Chisora, and he might have lost if not for the referee stepping in and twice taking points away from Dereck. 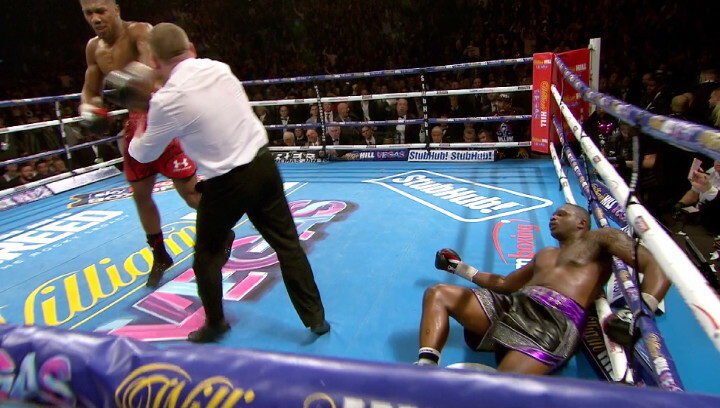 Chisora was fighting two guys out there on the night, Whyte and the referee. It was awful to watch. The performance from Whyte showed that he can’t even be trusted to beat a journeyman, let alone Joshua.